Ana Wu: Prof. Matsuda, you majored in journalism. Could you tell us your background and why you became interested in being a professor in rhetoric/composition and applied linguistics/TESOL? 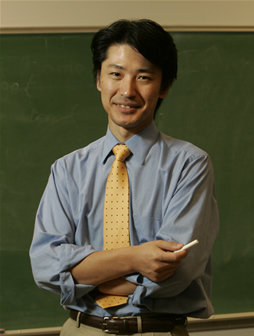 Prof. Matsuda: I was born and raised in Japan, and in junior high school, English was one of my least favorite subjects. I didn’t really start learning to use English until I was 16, when I signed up—out of peer pressure—for an English journalism class taught by a Canadian journalist. Trying to learn how to write news articles when I didn’t even know how to make a small talk in English, I knew I had a lot of catching up to do. So I started reading books about language learning and teaching to find out how best to develop my own English proficiency. In that process, I encountered two dominant ideas about language learning that I didn’t like—the Critical Period Hypothesis and the primacy of speech. All the odds seemed to be against me; I was already well past puberty, and I didn’t have easy access to a community of English speakers. But these obstacles ended up fueling my desire to succeed in learning English; I was determined to disprove both of these notions by learning English primarily through reading and writing. I read English newspapers and magazines every day, and I wrote one news article after another. By the end of the year, I was able to write news and feature articles as well as edit other people’s writing. By the time I graduated from senior high school, I was able to read and write well enough to function in college-level courses in the United States. When I came to the States at the age of 18, I was interested in studying journalism. But I was intimidated by the thought of competing with my NES peers, so I waited until the end of sophomore year to declare journalism as my major. As luck would have it, the teacher in my introduction to journalism course was an NNES from Korea who had worked as a news reporter. He would ask us to rewrite news stories and put them up on the screen anonymously for us to critique. At first, I felt a bit embarrassed to share my writing with my NES peers, but I was pleasantly surprised that I wasn’t able to tell the difference between my own writing and what my NES peers had written. I decided to go to graduate school because I wanted to teach writing and not necessarily ESL, but when I entered a master’s program in Rhetoric and Composition, I discovered that writing specialists were not paying enough attention to language issues and that L2 specialists were not paying enough attention to writing issues. This sense of problem became one of my major research agendas—to describe, problematize and change the interdisciplinary relationship between composition studies and second language studies. And one of the best ways to change the situation seemed to be to teach Ph.D. students in both fields, so I developed dual specializations in rhetoric/composition and applied linguistics/TESOL through my own Ph.D. studies. Ana Wu: You were the 2002-2003 Chair of the NNEST Caucus. Also, you are the founding co-chair of the Symposium on Second Language Writing. What’s the secret of your success? What advice would you give to NNES graduate students or novice teachers and researchers who are just starting their careers? Prof. Matsuda: This is no secret, but what drives my work is not the desire to succeed for its own sake or to publish for tenure and promotion. Instead, I do what I do because I see various language-related problems that need to be addressed, and I see research and scholarship as a way of addressing at least some of those problems. To me, the immediate outcomes that people tend to focus on—such as publications, tenure and professional recognition—are means to an end; they can enhance the credibility of my work and make it easier for me to accomplish my ultimate goal—which is to create a better environment for L2 learners (and their teachers). One piece of advice I have for all graduate students is to read, read and read. Trying to read everything that has ever been written about the topic of current investigation is a given; I also encourage my students to learn about new theories and methods even though they may not seem relevant to what they are currently interested. I do realize, of course, that having read everything is ultimately an unattainable goal. But it’s important to keep trying; without a broad knowledge of the field, we can’t fully understand the significance of anything—including our own work—which is always situated in a network of meaning in the field. I try to familiarize myself with a wide variety of theoretical and methodological perspectives so I can use them freely in addressing important issues in the field. But I remain critical of the tendency to serve a particular theory, method or discipline without considering the long term implications for students. This stance, of course, requires a broad-based knowledge of the field and how it works—both from historical and contemporary perspectives. Ana Wu: You have been teaching master’s and doctoral students. What are the differences, if any, when mentoring NES and NNES graduate students? What advice would you give to professors of TESOL or applied linguistic graduate programs who have international students? Prof. Matsuda: Having taught and mentored NES and NNES graduate students who are studying at various institutions and in various countries, I’ve come to see that what I believe about NES and NNES professionals in general also apply to graduate students: What matters is not whether someone is NES or NNES; instead, we need to see graduate students in terms of various factors—not only in terms of their language and writing proficiency levels (which can be an issue for both NES and NNES graduate students) but also their intellectual capacity, their breadth of knowledge, their involvement in various professional activities, and their commitment to the profession and to their students. In working with students who come from various linguistic and cultural backgrounds, one of the most important things to keep in mind, I believe, is to not take anything for granted. Educational institutions and practices tend to develop only with the idealized dominant population in mind (see Matsuda, 2006). To make graduate programs more inclusive, I believe we need to make explicit the tacit values, assumptions and expectations of the profession. I try to do that by providing opportunities to witness and participate in what goes on behind-the-scenes. I try to reflect openly on my own professional development efforts not only in the classroom but in informal conversations as well as through my lectures, publications (e.g., Matsuda, 2003; Simpson & Matsuda, in press), and websites (http://matsuda.jslw.org/blog.html). One advantage I have as an NNEST and former international student is that I can draw on my own experience in talking about various issues that NNES international students might face in graduate programs, on the job market and in the profession. Although mine may not be a typical story, my own experience does provide a glimpse of what it could be like for others. I also try to learn from the experience of my students and other professionals in the field—both NESs and NNESs—to provide a broader perspective on various aspects of professionalization. Ana Wu: I find it very inspiring to see you, your wife Aya Matsuda (also a professor and active member at TESOL) and your little daughter at TESOL conventions. As you both are professors, how do you two balance career with family? For me, the pendulum keeps swinging from one extreme to another: There are times when I feel like giving up my career so I can give all the time and attention that my daughter needs and wants; then there are times when I think about getting a small condo so I could focus on my work without being interrupted every half an hour. But I know neither of the options is realistic, and neither of them is really what I want. We sometimes take our daughter to conferences out of necessity—because both of us are presenting or are involved in various committees. When we do, and if the schedule works out, I make a point of taking my daughter to sessions and meetings because I feel I don’t see enough men carrying kids at conferences. We are lucky that, so far, our daughter has been able to travel well and sit through sessions without making too much noise, and our colleagues have been very understanding and supportive. If we can get anything done at all, that’s because our daughter works harder than the two of us combined—she goes to preschool from 8 to 5 every day. But we did consider our childcare options carefully, and we are happy with what we have. Our daughter comes home energized, and we feel her social and developmental needs are being met much better than if she had stayed home. Although we started sending her to childcare so we could keep working, we now joke about how we should continue to work so we can afford to keep sending her there. So, I guess all we can do is to do our best and hope for the best—and be thankful to everyone for their understanding and support. Ana Wu: Thank you for this insightful interview! Simpson, S., & Matsuda, P. K., (in press). Mentoring as a long-term relationship: Situated learning in a doctoral program. In C. P. Casanave & X. Li (Eds. ), Learning to do grad school. Ann Arbor: University of Michigan Press. This entry was posted in Uncategorized on January 26, 2008 by AWu. Ana Wu: Could you tell us your linguistic, educational and professional background, and why you decided to be an educator? Rashi Jain: I have grown up in multilingual and multicultural India. My linguistic experiences are complex, and yet representative of the average Indian. When I was growing up, three languages formed my world—Hindi, Punjabi, and English. I was born and brought up in Delhi, in northern India where Hindi happens to be the primary language. My parents’ families belonged to the Punjabi-speaking belt of pre-partition India, and when they migrated from their home cities to Delhi during the 1940s at the time of the partition, they brought along the language as well as the culture. Further, the British left behind the legacy of English in India, and over years English has become a part of the mainstream life, especially in metropolitan cities like Delhi.When it was time for me to begin my formal education, my parents admitted me to a school where English was the primary language of instruction. When I finished my high school studies, I chose to pursue undergraduate studies in English literature. Around this time that I also started offering tutoring lessons in English to school students. The language thus helped me become financially independent. At the same time I discovered, like my mother, a deep liking for teaching. After finishing my undergraduate program, I joined a publishing house where I created educational content in English. After three years in the publishing world, I decided to return to academia and pursue graduate studies in English language teaching, a decision that brought me to the U.S. And here I am today, a doctoral student in the Second Language Education and Culture program at the University of Maryland, College Park!As I mentioned earlier, I inherited a passion for teaching from my mother. She once told me that the true test of good teaching is that the teacher has taught a concept so well and in such a manner that the learner can, in turn, teach that concept to someone else. I like to teach and I like to learn. I have further found that I tend to learn something well and meaningfully when I teach it. Plus, I enjoy the earthiness of teaching another person, especially the feeling that accompanies when I successfully communicate my ideas to the other person in a manner that renders those ideas learnable. It is not surprising then, perhaps, that almost all of my life I have taught people in one context or the other; and it so happens that I have done so without being formally trained for it first.In some ways, you could say that life has been preparing me to be a teacher. When I was a child, I would hop over to my neighbor’s house and teach Hindi and English alphabets to the young servant employed there. After finishing twelfth grade, I tutored younger kids in different school subjects. Not a particularly reflective thinker in my formative years, I think I learned how to teach by somehow absorbing ideas from around me. I spent a good part of my teenage years observing my mother tutor people (including myself). A homemaker, my mother tutored school students to supplement the family income. After finishing high-school I followed in the footsteps, and eventually decided to pursue teaching as a career. Perhaps my feeling of being at home with English had something to do with it as well. As I mentioned earlier, after finishing my undergraduate studies in English literature I joined the editorial team in a publishing house that created educational material for local Indian as well as U.S. audiences. Three years later, when I quit that job and was debating whether I should return full-time to academics, I found myself teaching a roomful of young adults preparing for national-level competitive examinations. I was again teaching with little formal training or support other than the materials that were provided to me and my own wits. Yet, like my other teaching episodes, this experience was both rewarding and meaningful, and I got to learn plenty myself. It was with my admission to a graduate program in education in the U.S. that my journey into formal teacher preparation finally began. It was an interesting turn of events, however. Whereas earlier I had all practice and little theory, now I was getting all theory and little practice. I enjoyed my coursework and adapted fairly quickly to my life as a graduate student, but I missed teaching. My first semester here, however, one of my courses required me to observe an ESOL classroom through the semester. I had recently arrived from India, did not have a car, and was still unfamiliar with the public transport system. That limited my choices in terms of opportunities available to observe ESOL classrooms. I suppose I killed two birds with one stone when I found that I could volunteer on campus and conduct English to speakers of other languages (ESOL) conversation classes in my free time. My professor was supportive and encouraged me to adapt my course assignment to the opportunity available. I finished the semester, turned in my paper, and over the next three years volunteered repeatedly and conducted a number of conversation group sessions . When I continued from the masters’ program into the doctoral program, I also gradually transitioned to becoming a teaching assistant in the department. My experiences that semester became my first formal induction into the world of college teaching, as well as into the world of teacher education. This was followed by a summer course where I worked with my academic advisor to create, design, and implement a new course. The grounds were being prepared for me to teach a college course independently, and this semester I finally got an opportunity to do that. I have just finished instructing a 400-level course, and have enjoyed the experience thoroughly. I am already looking forward to my next teaching assignment. Ana Wu: You were one of the three 2008 TESOL Leadership Mentoring Award recipients. How did winning this award affect you? How rewarding has it been to have Prof. Suresh Canagarajah as mentor (This program pairs selected individuals with mentors who guide recipients throughout the year as they contribute their time and expertise to TESOL and its varied activities and projects)? Rashi Jain: In Fall 2008, Prof. Brock Brady (past “NNEST of the Month” guest and present co-director of the TESOL program at American University) contacted me and told me that he wished to nominate me for the 2008 TESOL Leadership Mentoring Award. I have known Professor Brady since 2004, when I joined the WATESOL NNEST Caucus and met him in person. He is a wonderful leader, and has guided the WATESOL NNEST Caucus since its inception (he founded the Caucus), mentoring me and many others in the Caucus. When Prof. Brady contacted me, I was in India; I was needed at home by my family and had subsequently taken a semester off to be with my parents in India. Prof. Brady’s email came out of the blue. Sitting in my parents’ home, thousands of miles away, I suddenly felt connected again. Being able to share the news of nomination with my parents in real time made it even more special. When this was followed a few weeks later with the news that I had indeed won the award, my cup brimmed over. It just kept on getting better. I had been reading Prof. Suresh Canagarajah’s (another past “NNEST of the Month” guest) articles through my program in TESOL, and I requested Dr. Canagarajah as my mentor, almost as wishful thinking. Imagine my joy when I was told that he was willing to mentor me! Then I met him at the TESOL 2008 Convention in New York and he was so friendly and welcoming (and he has a pretty good sense of humor!). He has been mentoring me since, and given that we have common academic and research interests, it has been a wonderful learning experience. For instance, through personal correspondence and sharing his most recent writings, Dr. Canagarajah has helped me understand many of the nuances and complexities associated with World Englishes, as well as other issues in the field of TESOL. Ana Wu: You are the current president of the WA-TESOL NNEST Caucus. Tell us about the caucus. What activities and events do you promote? How many members are there? What concerns or research topics have your group been discussing? Rashi Jain: The WATESOL NNEST Caucus was founded by Professor Brady in 2004. The primary goals of the Caucus are to support NNESTs professionally, to build awareness of NNEST benefits, concerns and needs, to promote research on NNEST issues, and to encourage NNEST/NEST collaboration. We welcome NESTs and NNESTs alike, and share a common vision of professionalism and equity in the field of TESOL. I joined the Caucus in 2004, when one of my university instructors shared information about it. We were a small group initially that has grown steadily over the past four years. There are currently 40 members on the listserv. We meet regularly, and offer support to each other that spans both the academic and non-academic issues. We are also collectively and actively working on NNEST advocacy, as well as widening our audience. For instance, in the past year, we presented on NNEST-related issues at different campuses in and around D.C. We have also presented regularly at the TESOL Conventions as well as the state affiliate, WATESOL’s Spring and Fall conferences. Another instance of our collaboration is the forthcoming issue titled ‘AU (American University) Working Papers’ that is going to focus specifically on NNEST issues. This volume is going to be edited by Prof. Brady (and is his brainchild), and will have authored pieces—spanning conceptual, theoretical, and research papers—by many Caucus members. Ana Wu: You have co-authored chapters on language pedagogy, teacher identity, non-native-English-speaking teachers (NNEST) of English, and World Englishes. Also, you come from India, a very rich multicultural and multilingual place. What do you think of the native/non-native dichotomy? What do you think speakers should be called in the future? Rashi Jain: I have indeed been fortunate to have had the opportunity to work with Dr. Suhanthie Motha and Dr. Rebecca Oxford on two separate book chapters in a volume on NNESTs due to be published in 2009. Dr. Motha is my former university course instructor. In the book chapter that she co-authored with me and another student, Tsegga Tecle, we explore the manner in which our identities play out consciously and unconsciously in classrooms. The second book chapter is a result of the lessons taught and learned in the university course that Dr. Oxford (my doctoral advisor) and I co-instructed on English language teaching around the world in 2007 (Oxford & Jain, forthcoming). As I mentioned, I am from India and the initial twenty-five years of my life that I spent in this linguistically and culturally diverse environment have had a tremendous impact on my own perceptions of such notions as who is a native English speaker and who is not. As a point of illustration, I first came across the deliberate use of the construct ‘native English speaker’ only upon my arrival in the U.S. In India, where multilingualism is the norm and people generally speak more than one language from at any given stage of their lives, such concepts as native speaker and non-native speaker seem to hold little currency. Opportunities of practice and contexts of use are of much more relevance there when gauging competence, than such ideas as the age of the learner or whether the language in question is a first language or not. As a result, notions of who is a legitimate speaker of the language and who owns the language take on a different hue when we talk about India. These understandings and experiences have in turn shaped the way in which I perceive proficiency, legitimacy, and ownership issues as they related to English language here in the U.S. as well. For instance, as a language instructor here in the U.S. I see my students as simultaneously English language learners and English language users and share with them my own experiences as an international visitor, and also the idea that my goal as I adapt to life here is not strive to speak like an American, but to be understood by anybody who speaks any variety of English. As I discuss in the chapter with Dr. Motha and Tsegga, I use my own identity as a user of English as an example and a pedagogical tool to instill a feeling of ownership and confidence in the students with regard to English, as well as my identity as a foreigner adapting to a new culture to show them that I empathize with them and the challenges they face. To answer your question about the dichotomy between native speakers and non-native speakers, I will try to give a straightforward answer to a pretty complex and at times, controversial, topic. I believe that the native-nonnative dichotomy is artificial and at the same time the terms are not used in the neutral sense, as they are sometimes projected by linguists. The ground realities are such that a label like ‘native speaker’ can give access to one person and deny another a salary, a better life, and professional respect and dignity. In addition, sometimes these labels apparently become a cover for more insidious agenda, such as hiring on the basis of race. That would explain instances where blonde-haired, blue-eyed non-native English speakers are sometimes hired over non-blonde-haired, non-blue-eyed non-native English speakers. Appearances and perceptions seem to matter more, in some cases, than professional competence and abilities. Your other question regarding what speakers should be called in future is far trickier to respond to. It is difficult to give a one-word answer to that question because no matter what term you use, something gets overlooked, something gets misrepresented, and something gets misunderstood. Further, it is tricky business because I think writing, by its very nature, is expected to be an exercise in ‘fixing’ terms. We have to use terms, and if we’re responsible writers, we are expected to provide definitions, rationale, and explanations of why we say what we say. But the reality is that we’re constantly moving on and beyond those ideas fixed in a particular time-shot, and I suspect the same holds true for the people we read. So on one hand, we have terms that fail to comprehensively represent current realities, and on the other, we have authors who use terms and then as their own understanding progresses, move beyond those terms. As a result, it’s tricky business trying to take a definite stand on a surface that is constantly shifting and getting reshaped. Having said that, I believe that Dr. Motha comes pretty close to comprehensively capturing the complexities of teacher identities in using the term ‘translinguistic teachers’ (Motha, Jain, & Tecle, forthcoming). Dr. Motha envisions translinguistic teachers as multi-competent and multilingual teachers who could be native speakers of any language. The terms ‘native’ and ‘non-native’ tend to present a rather one-dimensional, some will say monolingual, view of language ownership, and the term ‘non-native’ especially puts the spotlight on what is not, rather than on what is. The term ‘translinguistic,’ on the other hand, refers to teachers who have undergone the cognitively complex process of developing proficiency in an additional language, and in many cases, multiple languages simultaneously. This is the term that Dr. Motha, Tsegga, and I have used in our forthcoming chapter. As we have expressed in the chapter, we believe that the experience of traversing languages creates new understandings and processes, supports conceptual fluency, and allows teachers to draw on a broader range of concepts and interpretive frames than are available to monolingual teachers. We therefore use the term “translinguistic” rather than “NNEST” identity in order to foreground what we believe is relevant pedagogically: not what has been framed as a “lack of nativism” (Liu, 2004) but rather the considerable linguistic and pedagogical resources that translinguistic identity offers English language teachers. Ana Wu: Thanks for this interesting interview! Liu, J. (2004). Confessions of a Nonnative English-speaking professional. In L. D. Kamhi-Stein (Ed. ), Learning and Teaching from Experience: Perspectives on Nonnative English Speaking Professional (pp. 35-47). Ann Arbor: University of Michigan Press. Motha, S., Jain, R., & Tecle, T. (forthcoming). Translinguistic Identity As Pedagogy: Implications for Teacher Education. In A. Mahboob (Ed. ), Nonnative English Speakers in TESOL: A resource book. Oxford, R., & Jain, R. (forthcoming). “Taking the arrogance out of English” and “Letting go of imperialistic beliefs”: new perspectives on World Englishes, Non-Native English Speakers, and Non-Native English Speaking Teachers from a graduate course. In A. Mahboob (Ed. ), Nonnative English Speakers in TESOL: A resource book. This entry was posted in Uncategorized on January 1, 2008 by AWu.